What is a featured employer? A featured employer is an employer with is company logo displayed on Jobmire's home page. The 5 employers with the daily highest bid will appear on the home page. All other bidding employers will appear on a special page dedicated for the featured employers. How to become a featured employer? Employers have until 17h00 (Eastern Time) to place their wager to appear as featured employer for the following day. 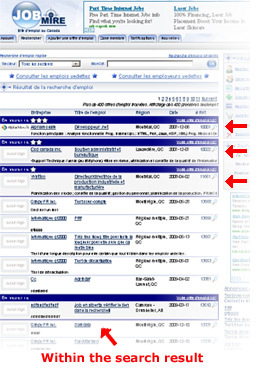 For exemple, the 5 employers with the highest bid at 17h00 on 01-01-2009 will appear all day long on JobMire's front page on the 02-01-2009 (until 17h00). At any time, you can check your bid status. You'll also be alerted by email if someone outbid you. In the following example, the GT2000 business is ranked in 3rd position. 3) At any time you can ameliorate your rank by adjusting your bid to the shown amount below the targeted position. NOTE: An employer will be featured only in his province and his position will be calculated taking into account only the employers in his province and not all employers of Canada. ex: You are a featured employer of Quebec. You will appear in the list of featured employers in the province of Quebec. You will not appear in the list of featured employers for a candidate who has selected of Ontario as province. Put your business as featured employer ! What is a featured job offer? A featured job offer get the edge over other job offers by getting prime visibility on JobMire. Your job offer could be a featured job offer for as low as 1 (equivalent to 5¢). An auction bases system allows you to improve your rank by bidding with Jobmire points. Where can I see my featured job offers? How to place a featured job offer? Employers have until 17h00 (Eastern Time) to place their bets for the following day. At any time you can check your bid status for the feature job offer auction. You will also be alerted by email if someone outbid you. NOTE: An job offer will be featured only in its province and its position will be calculated taking into account only the job offers in its province and not all job offers of Canada. ex: Your job offer is featured in the province of Quebec. Your job offer will appear in the list of featured job offers in the province of Quebec. That job offer will not appear in the list of featured job offer for a candidate who has selected Ontario as province. Place your featured job offer !